At his moment 15.000 people are on the Eurotransplant waiting list, in need of an lifesaving organ transplantation. According to UNOS, every 10 minutes someone is added to the waiting list. Transplantation is their only chance of survival. A transplantation is tough on body and mind. But after a successful transplantation people are able to live a reasonably normal life. A healthy lifestyle and regular physical activity may have a positive influence on the long-term results of transplantation. Transplantoux emphasizes the importance of organ donation, raises awareness and motivates people after a transplant to be active together, thus connecting transplant patients with peers and their families in a sporting environment. Furthermore Transplantoux aims to improve the long-term outcome after transplantation by conducting multidisciplinary scientific research. In 2008 Transplantoux (transplantation + Mont Ventoux = Transplantoux) was founded. The Mont Ventoux is a symbol for the mountain every one of us (‘tous’ in French) could run into or collide with. The organ donor didn’t make it to the top of his mountain, but in failing gives the transplant patient a chance to climb his or hers. Today Transplantoux is a non-profit organization that organizes sporting activities throughout the year on every level and promotes a healthy lifestyle. Walking, cycling, triathlon, … , staying active together on a regular base keeps mind and body healthy. Prof. dr. Diethard Monbaliu, founder and chairman of Transplantoux: “With transplanted members engaging in sporting activities and involving their family and friends, and medical supervisors, Transplantoux sets an example for society. We bring people together and let them exceed their own limits within their physical and mental capacities.” There is room for socializing and spending time together. Transplantoux also stimulates multidisciplinary scientific research to improve the long-term outcome after transplantation. 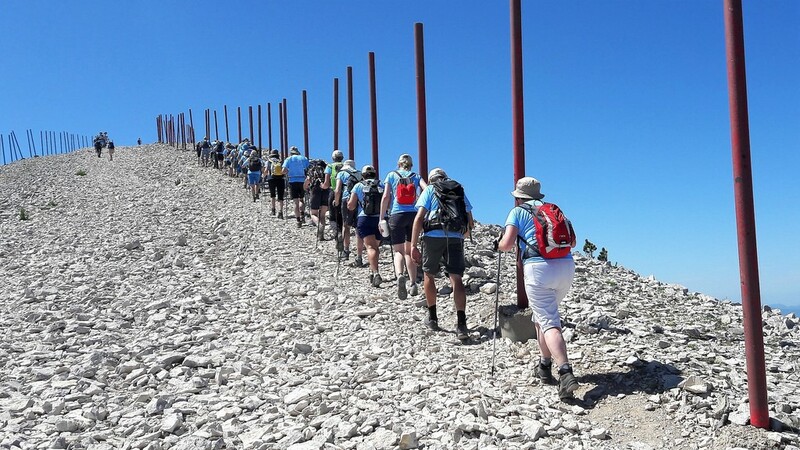 Every 2 years Transplantoux organizes the climb of the mythical French mountain Mont Ventoux, by bike and on foot, for transplant recipients. Also present are medical supervisors, family and friends. Preparations for this event take 6 to 9 months and the actual climb is much anticipated.